Our dedicated nursing team, united by their love of animals will care for your pets when they are in. 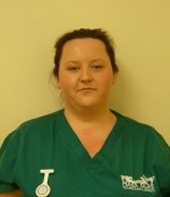 Kelly has been working for Maes Glas Vets since December 2006 and qualified as a veterinary nurse in 2010. She has a keen interest in dog and cat behaviour and has achieved an advanced higher certificate in dog behaviour and training professional practice with the Cambridge Institute of Dog Behaviour and Training. She is currently studying for the ISFM Advanced Certificate in Feline Behaviour. 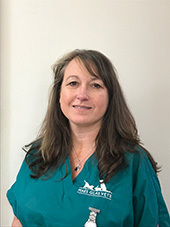 She advises clients about dog and cat behaviour issues including desensitisation to the veterinary practice environment at our Brackla branch with proven results. Kelly now leads the nurse management team as head nurse and is looking forward to improving and augmenting our nurse consultation service. She's also a serial fosterer of needy baby animals for local charities. 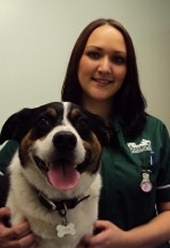 Tammy joined the practice in 2009 and gained her veterinary nurse qualification in 2014. She organises the night nursing team, providing overnight care for our inpatients and is part of the nurse management team. 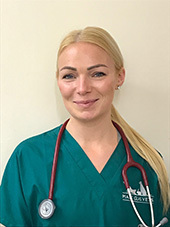 Her clinical interests include emergency and critical care and she has recently completed a level 4 certificate in Veterinary Nursing for Emergency and Critical Care. Tammy has a guinea pig, several parrots and four dogs which she enjoys taking out for long runs. 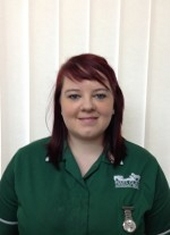 Amy started her nursing career at Maes Glas in 2009, qualifying as a registered veterinary nurse in January 2013. Apart from a brief stint at another practice, she has pursued her career at Maes Glas and has been part of the night rota for a number of years and is a member of our nurse management team. Amy particularly enjoys inpatient nursing and managing critical cases and has completed a merit award in anaesthesia and analgesia. She is currently deciding which further qualifications to pursue next. Outside of work she enjoys socialising and spending quality time with friends and family. She loves helping out at local charities and frequently fosters sick and injured animals. Her cat Arthur, was adopted after being brought in following a traffic accident. 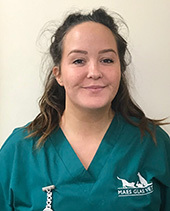 Since starting as a trainee with Maes Glas in 2007, Kerry-Ann has developed an interest in orthopaedic nursing and laboratory work and is hoping to pursue these interests further during her nursing career. Kerry-Ann is a qualified dog groomer and gained her coveted registered veterinary nurse status in 2015. Kerry Ann is the Maes Glas Clinical Coach Co-ordinator and is part of the nurse management team. Outside of work Kerry-Ann enjoys horse-riding, walking Kobi, her dog and camping trips with hubby, Dave. Abbie started with Maes Glas in June 2014 after initially training to be a dancer. She has loved animals from a very early age and after a transformative moment at an elephant sanctuary in Thailand, knew she wanted to work with them. Her interested are neonatal and paediatric care and she is also interested in nutrition and weight management. At home she enjoys walking her pack of 8 dogs as well as travelling, dancing and keeping fit. 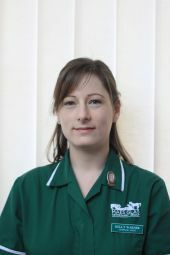 Leanne joined the practice in July 2002 after leaving college, and qualified as a veterinary nurse in 2008. Leanne enjoys branch work and has also worked at our main premises in Bridgend where her main focus was on management and infection control. At home she has a few pets of her own, including two cats, two dogs, two guinea pigs and four horses. Outside of work in her spare time she enjoys looking after her horses and watching rugby. 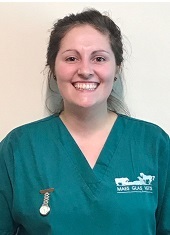 Jemma started working for Maes Glas Vets in September 2012 as a student and qualified in January 2014 following an Equine Science degree completed in 2009. She particularly enjoys radiography and laboratory work and has a strong interest in anaesthesia and surgical nursing which she wishes to gain further qualifications in in the future. In her spare time, she enjoys riding and competing her horse, walking her two dogs and playing a spot of rugby when she gets the chance. Jemma gained an additional qualification in Animal Physiotherapy in 2017 and has a physiotherapy caseload now in addition to her nursing. Kayleigh started with Maes Glas in June 2006, qualified in January 2010 and has worked in the Llantrisant branch since August 2009. She mainly works with small animals but enjoys going out on large animal calls and is interested in exotic animals. She enjoys socialising, walking her dog Zaffa, watching both local rugby teams and International games and dreams of going on the Lions tour. Jessie joined Maes Glas Vets in December 2012 after studying equine business management at Harpury College for two years. She qualified as a veterinary nurse in 2016. 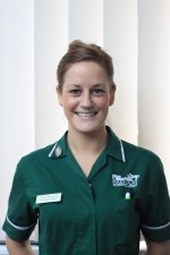 Jessie is part of the night rota team and has a keen interest in emergency care, caring for inpatients, wound management and hand rearing young animals. Outside work Jessie enjoys looking after and riding her 2 horses, travelling and walking her two dogs -Rosie and Eddie both rescued from local charity, Friends of the Animals. 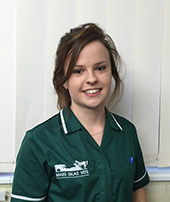 Sarah joined Maes Glas in June 2017 after studying for a Veterinary nursing Science degree in Hartpury College and qualified as a registered veterinary nurse in October of that year. After a short while travelling around Australia and New Zealand, she has returned to Maes Glas. Her clinical interests include animal behaviour and critical care. When not in work Sarah enjoys walking her dog, Riley along the beach and travelling. 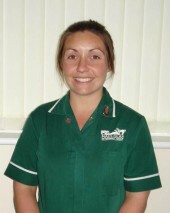 Sian started with the practice in 2008 and qualified as a registered veterinary nurse in 2013. 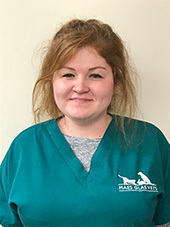 She loves working as a branch nurse, and is currently working part time in our Porthcawl branch; she particularly enjoys the extra client and animal contact which she gets in a smaller branch. 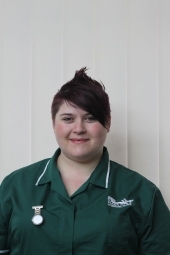 Sian's main clinical interest is feline nursing. Sian has 5 cats of her own and also performs in open water swimming events, in 2015 having done a sponsored 5km open water swim on behalf of Friends of the Animals, RCT. After teaching languages for over sixteen years, Tracey decided to change her career and train as a veterinary nurse. Tracey loves walking with all creatures - great and small (she used to have 14 pythons!) but she particularly has a soft spot for the older, more geriatric animals (in her words "like her!") and can be found giving them that little bit more fuss and attention to try and make their time with us as stress free as possible. She also enjoys the more holistic approach of nursing at our branches, where she can get to know the clients and their pets. Nicola started as a Saturday girl back in 2009 and took up a full time position as a student nurse in 2012, graduating from college in 2016. 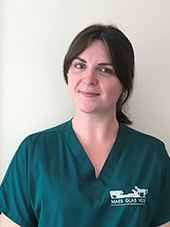 She was selected to be our new Cowbridge branch nurse early in 2017 where she now spends the majority of her time and enjoys a wide variety of duties and getting to know our new Cowbridge clients and pets. She enjoys riding her horse, walking her dogs, eating out and visiting foreign lands. Carla Jones has worked at Maes Glas since 2001. She started off as a student veterinary nurse and qualified as a veterinary nurse in 2006. 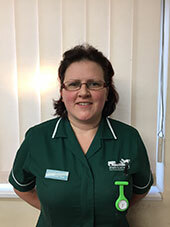 Carla then became Head Nurse and was responsible for overseeing the nursing care of all hospitalised patients and assisting our veterinary team in making sure that our hospital is organised and provides a high standard of care. Carla now works part time and is enjoying life as a young mother. Katie qualified from Monmouth College at the start of 2018 and is one of our night nursing team. She enjoys providing nursing care to all inpatients and is interested in critical care cases. Outside of work she enjoys keeping fit, long walks with Dudley, her dog who she rescued as a puppy and rock climbing. Hannah achieved her qualification in 2018. Her main interests are inpatient care and also small mammals and wildlife nursing. Hannah is a serial failed fosterer, having taken on permanent ownership of a three legged lurcher called Hopper and a white fluff ball called Lulu, both foster pets from Friends of the Animals. She enjoys socialising with friends and walking her dogs. Debbie has worked for Maes Glas for over 15 years, qualifying in 2008 when she also received the student of the year award from Pencoed College. After running our Pencoed branch for a number of years, she took a break to concentrate on family life however she is now back and combines working part time in our Porthcawl branch with being a wife and busy mum to two boys. Debbie has undertaken bereavement advice training and enjoys running weight and nutrition clinics. She loves to chat to clients about the best way to care for their pets. Debbie loves cooking and travel and is enjoying training new puppy, Nell. 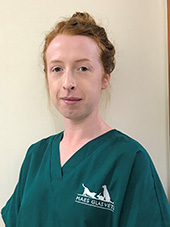 Claire started her nursing career at Maes Glas in 2004 following completion of a national Diploma in animal care and qualified as a Registered Veterinary Nurse in 2006. She has a keen interest in equine work and regularly assists vets at our equine site. 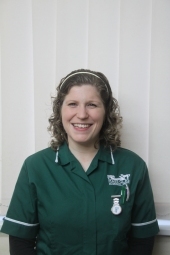 Claire enjoys providing care for our inpatients and assisting with emergency cases. 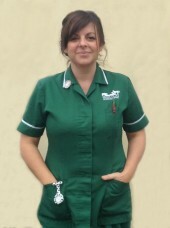 Becky started off as a Saturday girl in the Llantrisant branch, took up a full time position in Aug 2008 and qualified as a veterinary nurse in 2012. She works mainly in the Llantrisant branch but also does night nursing shifts in Bridgend. At home Becky has a retriever called Sonny, 2 cats and Leon the chameleon. She mainly works with small animals but is interested in exotics and also enjoys advising on dental problems and hopes to work towards an extra qualification in this area. In her spare time she enjoys taking Sonny for long walks on the beach. 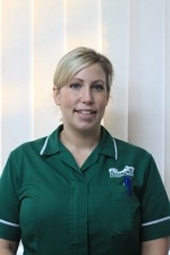 Nadia has worked at Maes Glas since 2004 and qualified as a nurse in 2006. 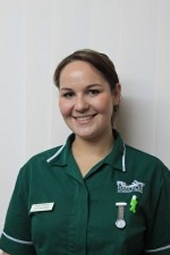 Nadia enjoys all aspects of her job and has a keen interest in radiography and hand rearing young animals. She became deputy head nurse under Carla Jones in 2013 and helps organise the clinical care of our hospitalised and day patients. Nadia now works part time after starting a family in 2017. In her spare time she enjoys walking her dogs.